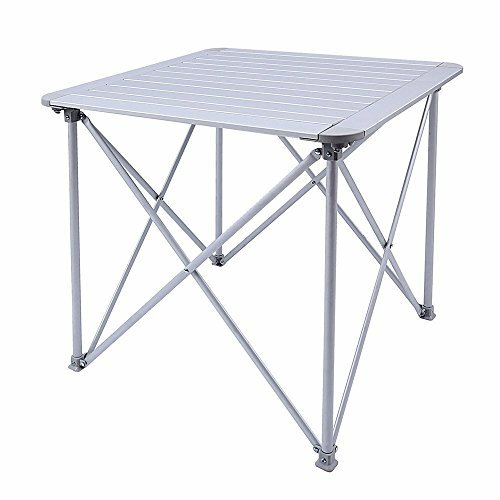 KingCamp lightweight portable strong stable aluminum alloy roll up top folding table for 4 persons is multi-purpose which is perfect to be used indoor as a sofa table, or bring it to outdoor activities for picnic, camping, beach, patio parties, fishing, and more! With the split type design for the board and bracket, the desktop can be rolled up and the stent can be folding, so it is easy to open or fold at anytime to help you save much time. The desktop is made of aluminum alloy and anode oxidation treatment, no rust, corrosion resistance and easy to clean up. The table weight is 11 lbs and after folded the size only has 35.5 x 7.5 x 5 inches, which make it portable and light enough to be carried around your trip to meet your camping needs. The carry bag for this table will be easy to take with the handle.